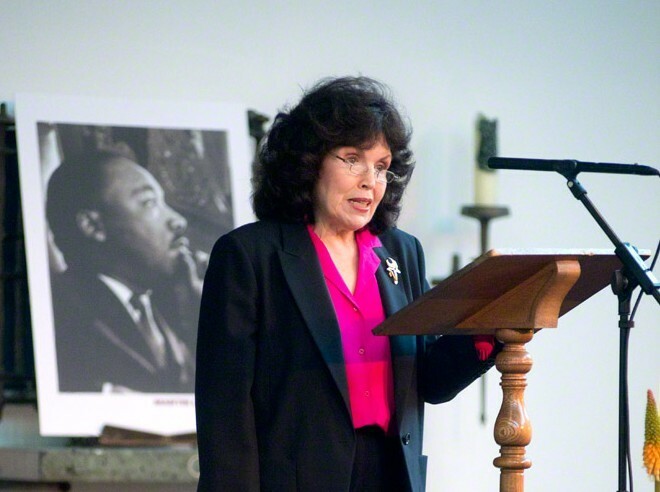 Soon after graduating from Ohio Wesleyan University, Mary Elizabeth King went to work for the U.S. civil rights movement, first in Atlanta and then Mississippi, 1962–65, serving on the staff of the Student Nonviolent Coordinating Committee. Uniquely among the SNCC personnel, she has built her academic specialty on the study of nonviolent civil resistance and is acclaimed a top authority on the subject. Now a professor of peace and conflict studies at the UN-affiliated University for Peace (main campus Costa Rica), she is also a Distinguished Rothermere American Institute Fellow at the University of Oxford, Britain. Among her many works is Freedom Song: A Personal story of the 1960s Civil Rights Movement, an autobiographical account of her experiences for which she received a Robert F. Kennedy Memorial Book Award. She is the author of Mahatma Gandhi and Martin Luther King, Jr: The Power of Nonviolent Action, as well as A Quiet Revolution: The First Palestinian Intifada and Nonviolent Resistance. In a collaboration with The New York Times, King wrote a reference volume on the national nonviolent revolutions that brought about democratic transitions in the Eastern bloc. Her latest book is Gandhian Nonviolent Struggle and Untouchability in South India: The 1924–25 Vykom Satyagraha and the Mechanisms of Change, from Oxford University Press. King served in the Carter Administration with worldwide oversight for the Peace Corps and responsibility for the domestic VISTA program and other national volunteer service programs. For her work on the theory and practice of nonviolent action, King has been awarded the Jamnalal Bajaj International Prize, the El-Hibri Peace Education Prize, and the James Lawson Award for Nonviolent Achievement. In 2011, Ohio Wesleyan University bestowed on her the honorary doctor of laws degree and she was elected a Fellow by Aberystwyth University, in Wales, United Kingdom — their equivalent to an honorary degree — where she did her doctoral work in international politics.